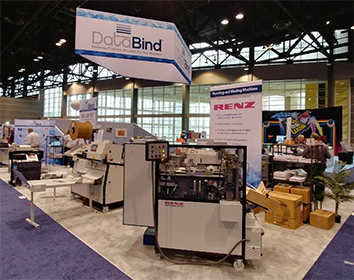 Profit, efficiency and a “HOT” new lamination process was the theme in the DataBind booth at PRINT 2018! Thanks to the many people who stopped by our booth in Chicago. We really appreciated your choice to visit with us during the expo. We know how valuable time is these days, so we sincerely hope you left with the feeling that your visit was time well invested. For those who couldn’t get to the show I thought I’d recap the highlights, the first in a word – was Calendar Printing! 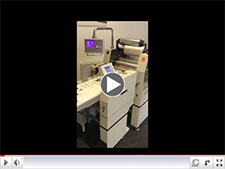 High speed punching on the RENZ AP 300 Compact and the AP 360 Digital and binding on the RENZ Mobi 500 created a lot of interest in solutions for calendar punching and binding. The machines are designed to set up quickly, run independently and accommodate wire, spiral and comb bindings with easy die change out. Visitors could see how fast and efficient these RENZ German-made machines processed stacks of DataBind “Chicago” notebooks that were the hit of the show. 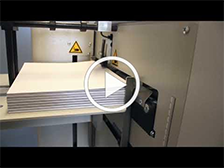 And for binding, the Mobi 500 demonstrated speed and high quality wire binding. Thanks to Eckhart’s Printing for sharing their Mobi 500 with us to use at the show! A special thanks to Michael Schubert, Managing Director of RENZ, for offering his expertise about RENZ machines and calendar solutions in our booth! Check out the Renz AP 300 Compact in action feeding a stack of collated materials! Argos Solutions with their cold technology F400 LED UV-Coater was another busy area in the DataBind booth. The cold UV lamp technology transfers 77° F only onto substrates and uses over 60% less coating material – making it a cost effective UV solution. The odorless enclosed lamp system also makes it healthy and safe for working environments. 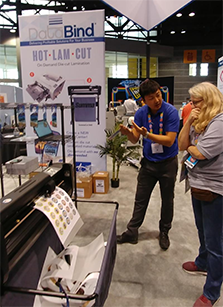 HOT-LAM-CUT was creating a new “buzz” with demos that wowed visitors with the on-demand versatility of die-cut lamination by combining a LAMI Revo-T14 and a SummaCut cutter. We introduced and provided samples of the new process with the assistance of our experts from LAMI Corporation. Their product expertise welcomed many visitors that stopped by to see the new process and how the new Revo-Office and Revo-T14 automatic lamination machines could save time, labor and reduce expenses. We were honored to have the LAMI team, Mr. Yohei Kishida(CEO), Mr. Daimon Ueda(GM), Mr. Jaewon Lee and Mr. Kazuki Miyoshi join us this year at our booth and PRINT 18. 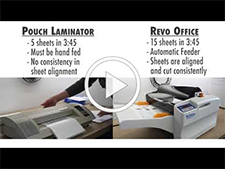 Check out how you can save time and labor with automatic lamination! Digital Foiling was also a hot topic and VIVID Laminating has successfully automated short to medium run lamination and foiling with their introduction of the Omni-Flow Feeder that combines with their award-winning Matrix. This innovative device is a high-pile feeder that automatically feeds sheets as large as 15″x 41″ at speeds of up to 66ft/minute. 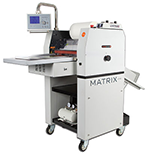 It can be retrofitted to the Matrix series, adding more profitably to machines that are already running in the market. Check out the VIVID Matrix Omni-Flow Feeder for yourself! Michael Kreutle from Stago was very busy with demonstrations on a wide array of German desktop finishing machines ranging from stapling to drilling and round cornering. Customers were impressed with the ease and precision of the German-designed ESM 20 manual round cornering machine – made to corner a variety of substrates as well as paper. The HM 15 stapling machine also drew attention with its heavy duty construction that can set up for flat or saddle processes. See the ESM 20 Round Cornering Machine precision cuts! So thanks again to all, and a special thanks to our manufacturers, all of whom participated with us in the booth with additional expertise on hand to help educate and inform our guests. Our customers overwhelmingly let us know that they appreciated meeting the manufacturers and seeing the chain of support first hand. The RENZ AP 360 Digital is the perfect solution when high-speed, auto-punching performance is needed for book and calendar punching production. With fast die changes and a two finger pick-up – mixed stock is handled with ease. 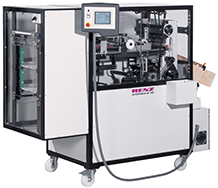 The RENZ AP 360 Digital punches up to 100,000 sheets per hour with horizontal paper feeding for easy product loading. Paper output options include a jogger or deep pile. Max. punching width is 14 inches and accommodates ring wire, calendar, coil, plastic comb and tear-off patterns. For more information on the AP 360 Digital contact Jon Gasperini. Q. How do I know how many loops for 3:1 ring wire are needed on a custom length book? A. As a general rule of thumb, the formula would be: length x 3 minus 1 = loop count. For example, if your book has a binding edge of 9 “; you would multiply 9×3=27-1=26 loops. This is the common formula, but it is always best to punch the edge you are binding then count the holes for accuracy.